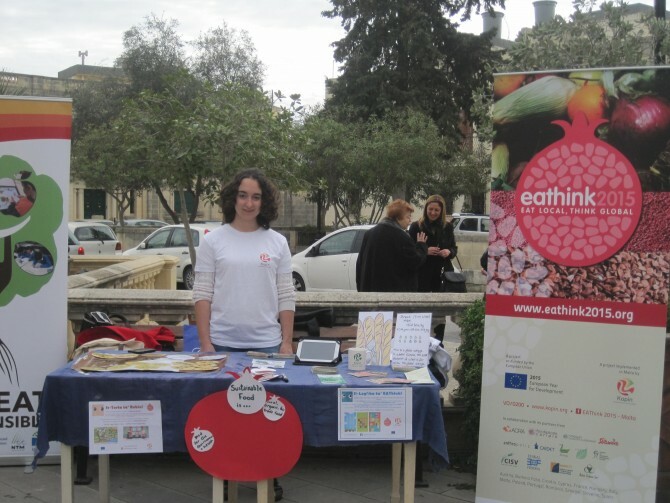 On Sunday 14th February, the Maltese EAThink 2015 team was present with a stand at the “Climate Change Awareness Day”, held in Attard during the morning. 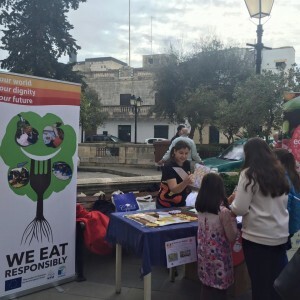 The event, jointly organised by Kopin – within the EU co-funded ClimATE Change project – and the Attard Local Council, aimed at informing the general public about climate change related issues and raise awareness on topics such as water scarcity, agriculture and local produce, environmental protection and fair trade. The programme included talks, activities for kids, musical entertainment, food and wine tasting and a film screening, all related to the topic of climate change and environmental protection. 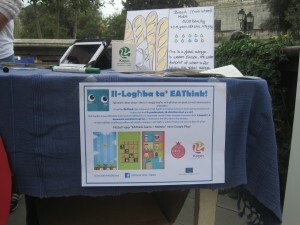 The EAThink 2015 stand offered a number of activities for young kids and adults alike, looking into the links between water consumption, food production and climate change, as well as the importance of alternative food systems, such as Fair Trade, both from an environmental and social justice perspective. The team and volunteers provided the general public with information related to climate change, food security and water scarcity and asked those engaging at the stand to write down what sustainable food meant to them…with colourful and various responses received from a number of kids! During the event, the team showed children and youth approaching the stand the newly launched applications “It-torta ta’ Robin” and “Il-logħba EAThink”, available on both Google Play and iOS both in English and Maltese.